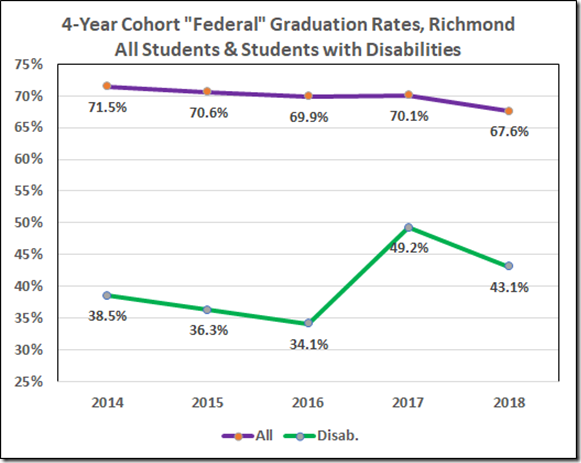 The estimable Carol Wolf sent me the link to an article reporting improving graduation rates of disabled students and asked whether that were reflected in Virginia or Richmond. 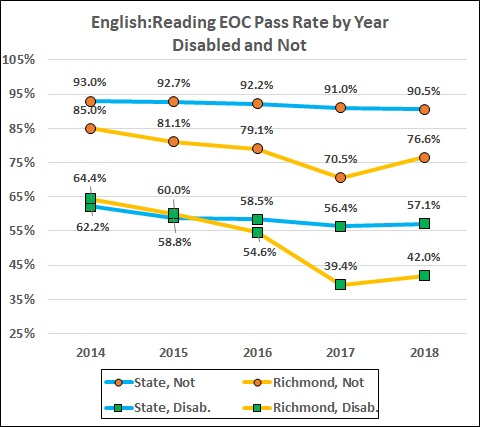 We earlier saw that Virginia’s graduation rate has been increasing while the reading and math End of Course pass rates were falling. 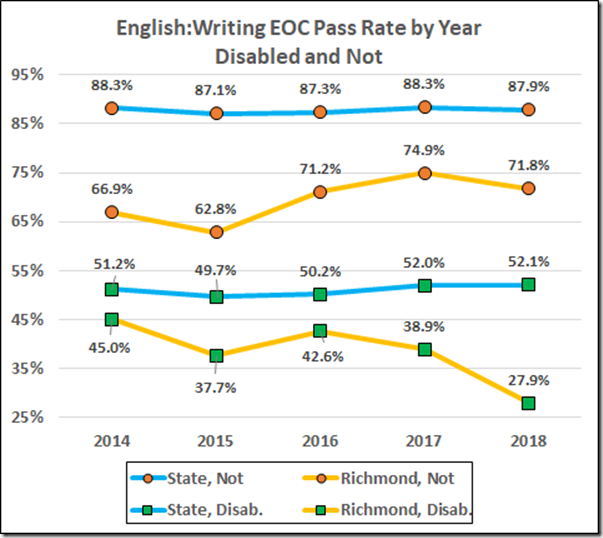 That is, the Board of “Education” has its thumb on the statistical scale. 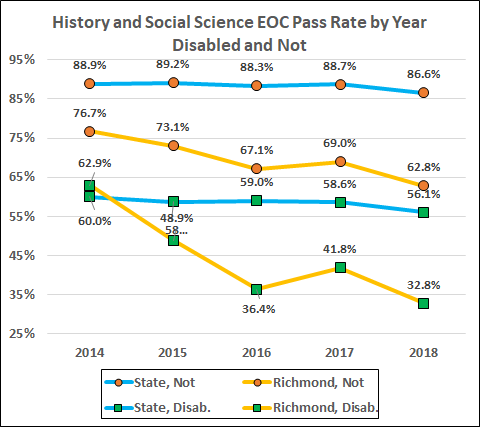 Per Carol’s’ inquiry, let’s take a closer look at the overall rates and delve into the rates for disabled students. 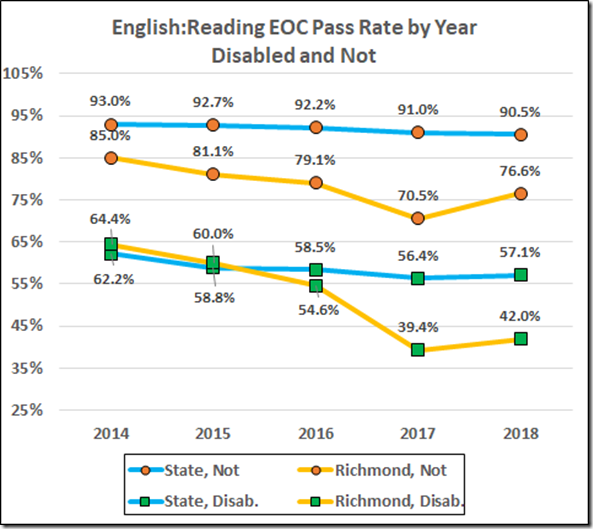 To start, here are the reading EOC pass rates for the past five years. Hmmm. 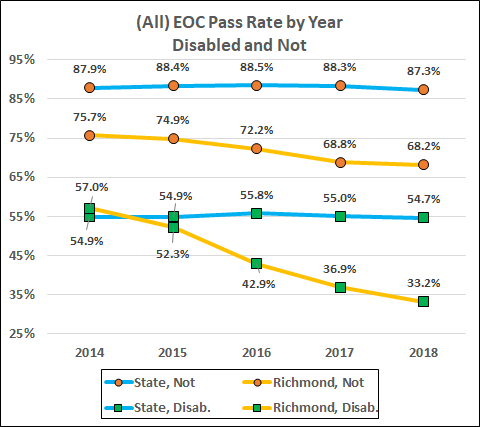 How might we explain those Richmond disabled numbers for 2014-16? Friar Occam might suggest cheating. In any case, this is not a picture of improving performance. 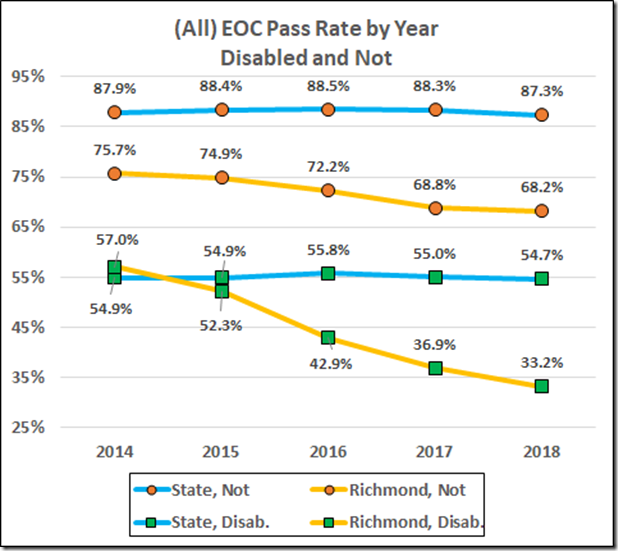 There are some bumps and squiggles there but the trends are clear: The state averages are fading and the Richmond, plunging. The five subject average smooths out the variations. 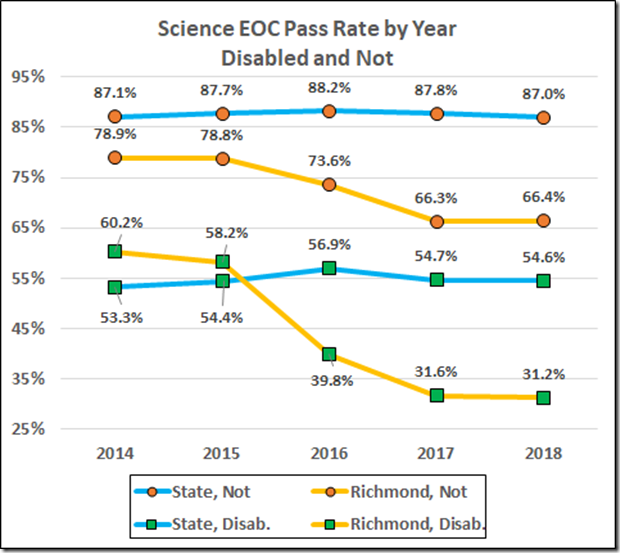 That’s clear enough: The statewide averages have declined in the last two years; despite some gains in ‘15 and ‘16, those averages have declined overall since 2014. 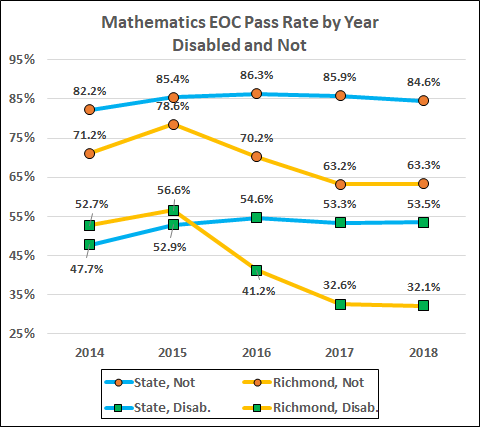 The Richmond averages have plummeted. 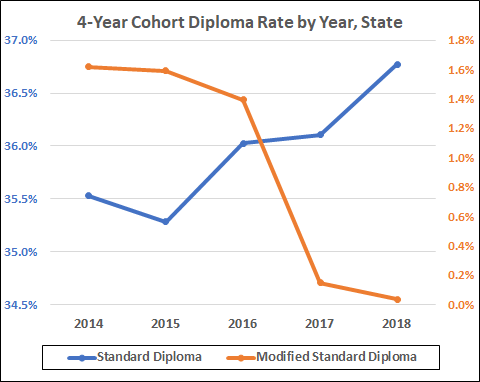 Turning to diplomas: Our educrats report (and brag upon) an “on-time” graduation rate. 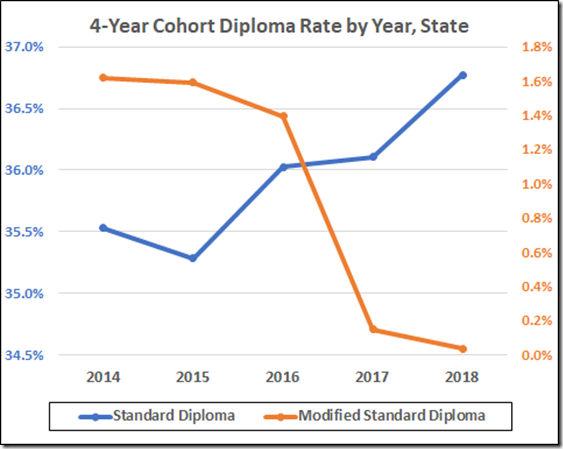 To get that rate they define “graduates” to include students who earn receive any of the following diplomas: Advanced Studies, Standard, Modified Standard, Special, and General Achievement. To their credit, the federales do not count the substandard diplomas: The federal rate includes only advanced and standard diplomas. 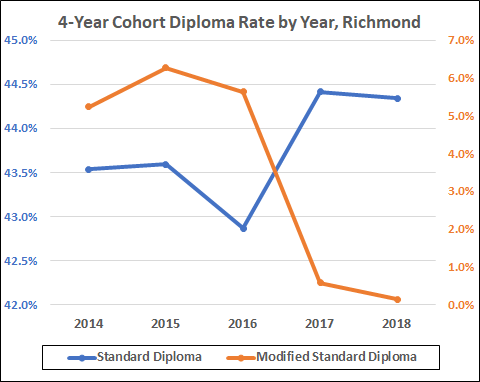 To combat that bit of realism, Virginia two years ago redefined the Modified Standard Diploma by allowing “credit accommodations” to transform it, in most cases, into a Standard Diploma. 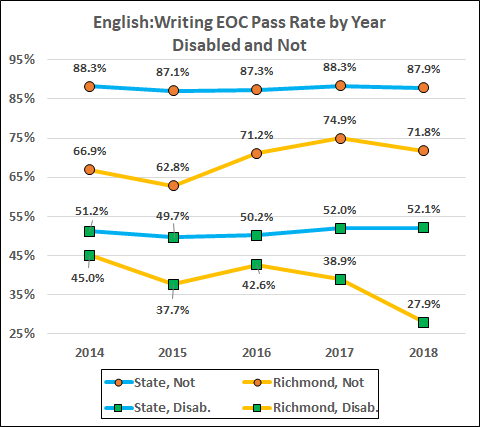 This had a nice effect statewide and a dramatic effect in Richmond. 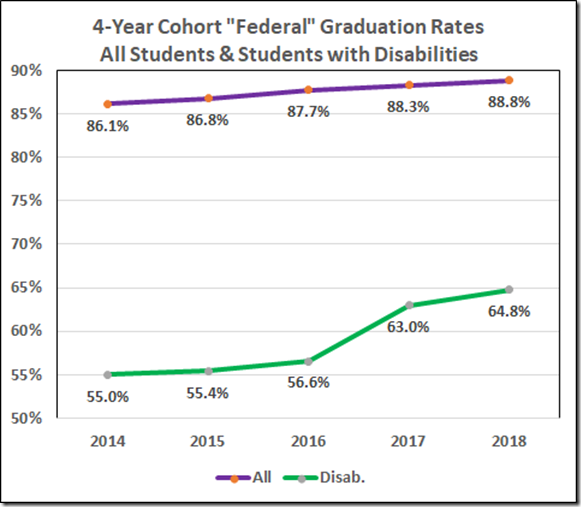 With that background, let’s look at the four-year cohort graduation rates. 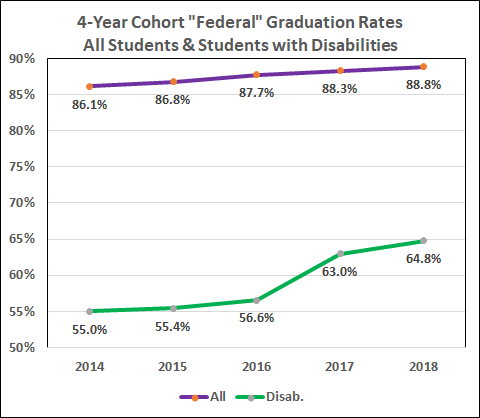 That 2017 bump in the disabled rate (that boosts the overall rate is some measure) reflects 1,200 or more modified standard diplomas that were transformed into standard diplomas by fiat. 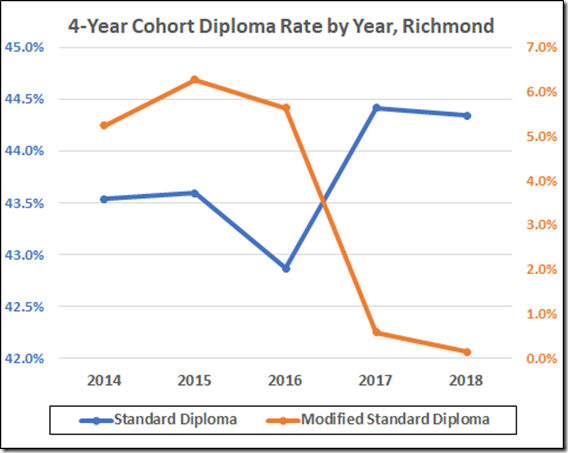 The redefinition give Richmond a nice bump in 2017 but the overall rate resumed its decline in 2018. So, yes, Carol. 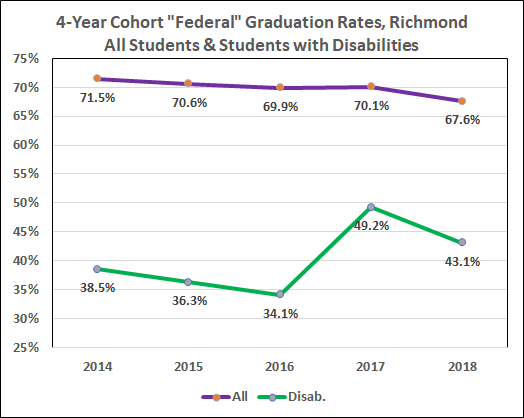 The Virginia four-year cohort graduation rates rose, both for disabled students and for all students. 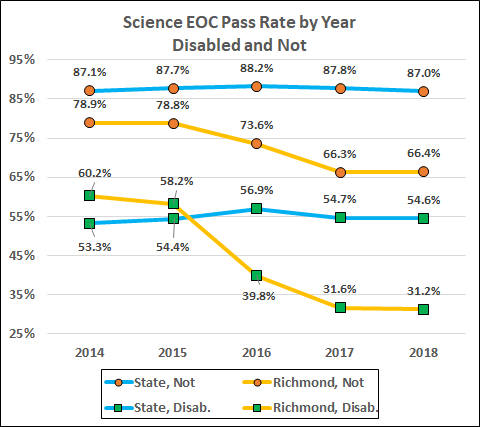 The rise was enhanced after 2016 by (even further) manipulated data. 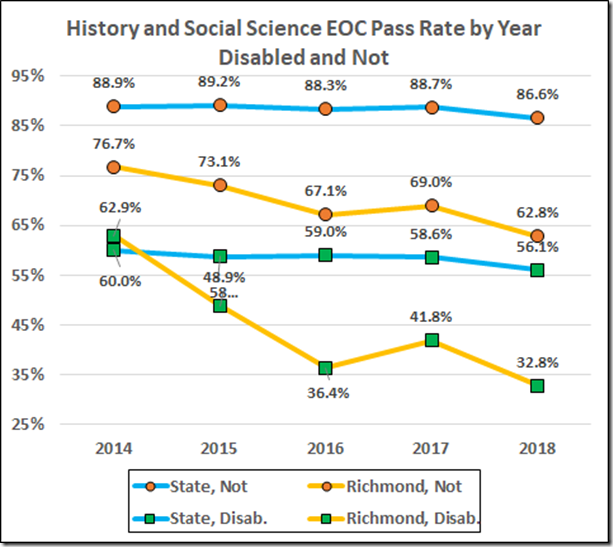 The rise continued at a time the pass rates in the End of Course SOL tests were declining. If you believe those improving numbers, I want to sell you some shares in a nice James River bridge. 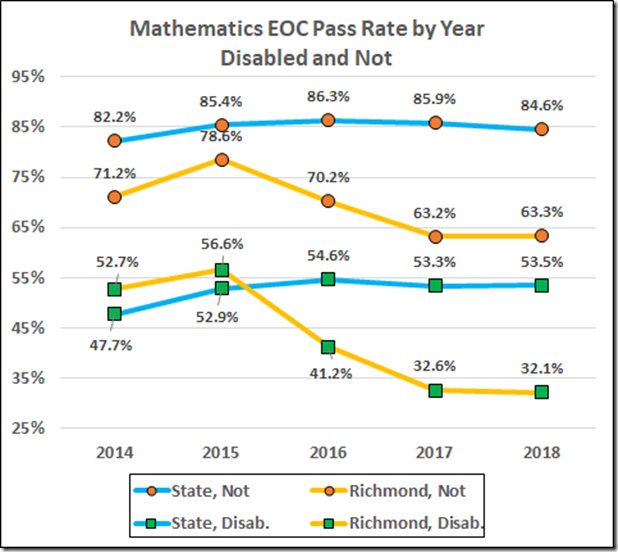 Richmond’s declining numbers remind us that even bogus statistics can’t make Richmond’s public schools look like anything but a menace to the students. Postscript: It looks like inflated graduation rates are a national phenomenon.